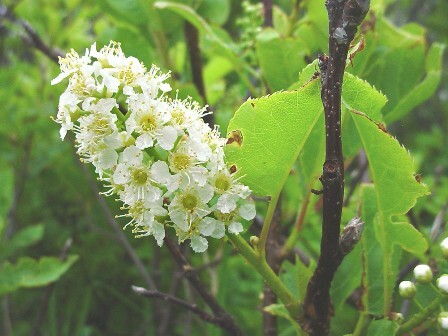 Chokecherry is native of western side of north America. It can be seen growing right from Canada to California. Chokecherry has now also reached Europe and is being grown in home and public gardens in Britain and other European countries. Chokecherry fruits very harsh and therefore these are very rarely eaten fresh. In fact the name “choke cherry” seems to have been assigned to this fruit because of their astringency. The fruits are, however, quite good for making jam and jelly. Due to this, these are sometimes also sold at fruit shops. Chokecherry was declared as official fruit of the American state of North Dakota, in part because its remains have been found at more archeological sites in the Dakotas than anywhere else. One interesting fact about choke cherry is about its antiquity. Anthologists are of the opinion that this fruit used to be harvested by people in Eurasia from 4000 – 5000 BC. 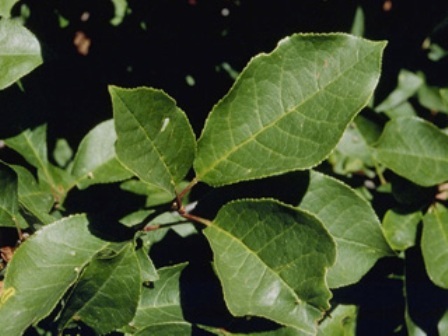 An erect to straggling shrub or small tree, 1-4 m tall, bark purplish gray, with small raised horizontal pores. Leaves alternate, stalks 5-15 mm long, with 1-2 purplish red glands near base; elliptic to ovate- oblong or oblong-obovate, finely sharp toothed, 4-10 cm long, usually abruptly pointed at the tips, bright green and hairless on the upper surface, paler and hairless to short hairy beneath. Flowers numerous in terminal, congested, elongated clusters, stalks of rather uniform length, mostly 4-8 mm long; calyx hairless, lobes spreading to curved back, oval finely glandular roughened, 1-1.5 mm long; petals almost round, 4-6 mm long; stamens about 25. Fruit a drupe, red to purple or black; shiny ovoid, 8-11 mm long, sweet but astringent. As chokecherry fruits have a harsh taste, so these are not fit foe eating directly out of hand. However, these are high in sugar and pectin. So these are good for processing into jam, jelly, juice, syrup etc..
Chokecherry fruits are considered a very good source of antioxidants because of their high anthocyanin content. 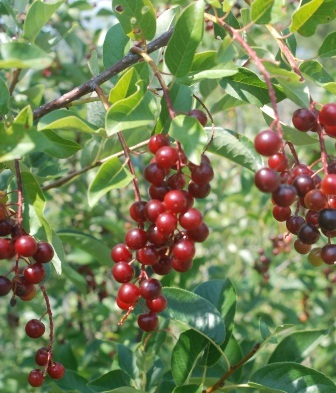 Chokecherry trees thrive best at sunny locations in well drained but moisture retentive soil. In wild, it is a fast growing tree with a tendency to form thickets. There are three recognized varieties of Prunus virginiana. 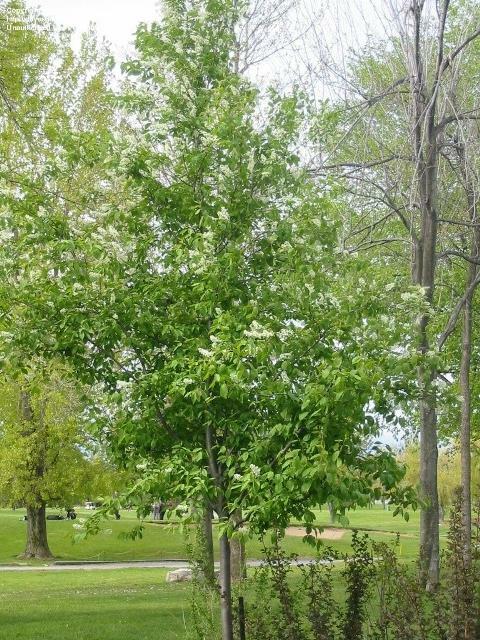 First is variety demissa which is commonly called western chokecherry. It produces dark red fruits. Second is variety melanocarpa produces black fruit. The third variety virginiana produces deep red fruits. Some nurseries sell plants of named varieties which they claim to be less astringent. New plants can be raised from seed or from cuttings.